I made some thyme infused simple syrup following the recipe from the Art of the Bar book, so I adapted and invented some libations to give it a test drive. B Restaurant and Bar with locations in Oakland and San Francisco has a delicious drink on their menu called Jones’ Grimace, it’s a blend of Bourbon, Sherry, Lemon Juice, Ginger Syrup and a Thyme sprig garnish. So I adapted this recipe to use thyme syrup instead, as I was out of ginger syrup and of course wanted to try my new syrup. Edit: On subsequent tastings the Clara Thyme needs a bit more work, I’ll have to revisit it sometime. Do you use a dry sherry or a sweet sherry for “On Claras Thyme”? 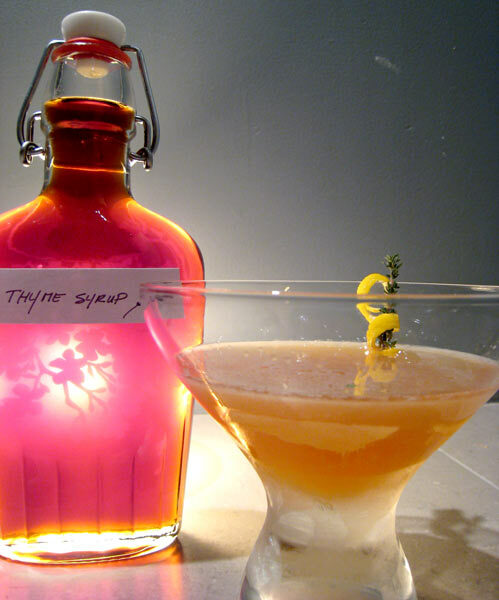 What’s the recipe for the Thyme infused simple syrup?